>> As a teenager in New Zealand I supplied our local craft store with fabric handbags patterned with all kinds of fabric dying effects. It was the mid 80's, and now fashion has come full circle (and so have I). I started designing accessories again recently as I wanted see my print designs through to a final product. >> I think the best way to describe my work is that it has a retro influence that is updated by using a variety of hand-drawn and hand-cut techniques (which bring in my own style). Most important is adding an unexpected element, either in color, scale, process or by combining different genres of textile design. >> When I find myself in a rut, I tidy and sort. My brain works in a chaotic way when I'm designing, so organizing my work space and reference materials helps to put my head in order. >> The idea of the organic roll up bag was developed over time. I knew I needed to do more about my environmental concerns - especially the issue of plastics in the ocean. So I spent a lot of time working out how to merge that with my textile design work. I wanted to be involved in something that was putting environmental and social integrity first. >> Growing up I wanted to be an archeologist, because I'm fascinated by history and travel, or an architect - I spent a lot of playtime designing imagery houses, huts and forts while my sister waited patiently (or impatiently) for the the "real" game to start. >> I played rugby league in New Zealand - I'm a very unlikely rugby player. I just used to run as a hard as I could because I was afraid of getting tackled. Goodship’s latest Summer ’09 Roll-Up Tote line is now available for purchase at thegoodship.myshopify.com! 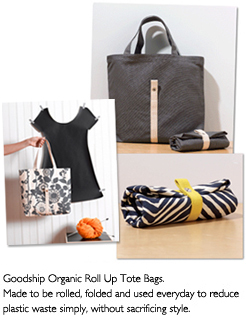 It's a reusable tote bag that rolls up and fastens with a snap. It even has an open interior pocket comfortably fits a bottle of wine. Lots of beautiful prints to choose from including unisex friendly solids (each one is handprinted in Brooklyn). These are great! I love it and off to check them out right now! I love her totes, they're so amazing and affordable!